In our last post, we took a look at the tumultuous years that followed the arrival of various groups of Europeans in North America. Disruptions from disease and war eventually escalated into a series of conflicts called the Beaver Wars (1640-1701). These conflicts forced Myaamia people to flee the Wabash River Valley and take refuge primarily near what is today Green Bay, Wisconsin. Following the end of the Beaver Wars, Myaamia people returned home to the Wabash River Valley. The formal end of this period of disruption and war came at the Great Peace of Montreal in 1701. At this negotiation, our ancestors recognized the Meehtikoošia (French) as the head of a new “family” alliance. The Meehtikoošia took on the responsibility of providing for their “children” and peacefully mediating disputes. In return, the many tribes of the Great Lakes Region promised to heed the advice of the French and to avoid conflict within the group as much as possible. This map shows the major village sites that Myaamia people reoccupied after the Beaver Wars. The three starred locations mark the locations of early French trading posts. The black star, Detroit, did not have a Myaamia village but was visited regularly by Myaamia people throughout the fur trade era. The Great Peace of Montreal opened of one of the longest periods of stability in our recorded history (1700-1780). In this period, Myaamia villages were largely left to govern themselves as they had prior to the Beaver Wars. Important decisions took into account the need to compromise with various groups, but at the heart of the decision-making process lay Myaamia knowledge, values, and beliefs. No group, European or indigenous, had the power to force their beliefs or ways onto Myaamia people in this period. No group had the power to force Myaamia people to leave their villages, and for the most part, Myaamia people could travel unimpeded throughout Myaamionki. As before the Beaver Wars, travelers had to respect their neighbors’ homes and resources and they still had to fear attacks from enemy groups. However, in this period of stability, none of these concerns could completely stop Myaamia people’s movements. In approximately 1700, Myaamia people began to live a “normal” life again. This period was certainly not free of violence, disease, hunger, or other disruptions, but the level of disruption was less dramatic than what was experienced during the Beaver Wars. Generations before the Beaver Wars, our ancestors settled the Wabash River Valley. Over many generations their lives became shaped by the rhythms of Myaamionki (Myaamia places). Following the return to the Wabash, Myaamia people were able to realign their lives with the ebbs and flows of the ecological cycles of their homelands. Once again they could utilize generations of experience and knowledge and change their practices, habits, and actions to be in tune with subtle shifts in an environment that they knew intimately. Myaamia women could plant their fields with the certainty that as long as they worked hard and the weather was stable, they would be able to harvest and store the fruits of their labors. They did not have to constantly worry about warfare driving them away from their villages, fields, or stored produce. Myaamia women and children were able return to gathering tubers in the wetlands, collecting greens and berries in disturbed areas, and drawing on the many sources of sustenance produced by the trees of the forests of Myaamionki. While there were minor risks to traveling outside of the village on gathering journeys, these risks were familiar and smaller in scope in this period. Myaamia men could travel widely within Myaamionki and hunt in relative safety. Conflicts still occurred on the hunting grounds, as they did prior to the Beaver Wars, but these conflicts were culturally familiar to our ancestors. Conflict on the hunting grounds was usually avoided through the practice of humble generosity. In 1824, Pinšiwa (J.B. Richardville) and Meehcikilita (Le Gros) described how Myaamia hunters avoided conflict on the hunting grounds. “It often happens,” they said, “that when one has shot a deer he will see at the same moment some other hunter coming towards him, and will immediately abandon his prize, pointing to it as to the property of the person approaching, and will march off to seek some other game.” This cultural tradition limited some but not all conflicts on the hunting grounds. Seasonal raiding returned to a smaller scale with groups of 30 or so Myaamia men engaging in guerilla style attacks, which sought captives and or the deaths of a few enemy villagers. In return, Myaamia people suffered the same kinds of raids on their villages. But these raids did not cause the kind of upheaval experienced in the Beaver Wars or later in our wars with the Americans (1780-1815). In short, these conflicts were of a size and scope that did not disrupt their lives to the degree that the entire community was unstable. 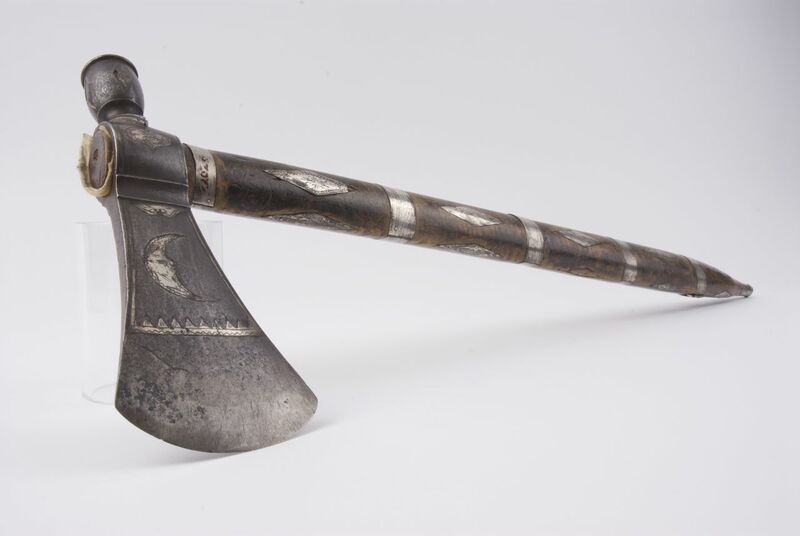 This takaakani (hatchet) is a presentation piece from the 1800s, but it represents the style of hatchet or tomahawk traded for from Europeans and used by Myaamia people as both as a tool and a weapon. The Waapaahšiki Siipiiwi (Wabash River) formed the heart of Myaamia homelands, and its fertile valleys were ideal for hunting, gathering, and agriculture. In addition, the Waapaahšiki Siipiiwi was a vital means of travel for many groups. The river was a critical link in a chain of travel, trade, and exchange that connected communities throughout North America. This system ran in many directions, but the main path nearest our ancestors’ homelands ran from the Gulf of St. Lawrence, through the Great Lakes, into the Maumee River, overland to the Waapaahšiki Siipiiwi, to the Mihšisiipi (the Myaamia believed that the Wabash ran all the way to the Mississippi), finally reaching the Gulf of Mexico. Our villages of Kiihkayonki (Ft. Wayne) and Wiipicahkionki (Huntington, Indiana) occupied opposing ends of the only significant portage on this route. A portage is a system of trails that links one navigable river to another, along which canoes and baggage must be carried. This was an advantageous location for Myaamia people, and it allowed them to participate in and benefit from the continental trade networks in a unique way. Prior to the arrival of Europeans, people exchanged objects, material resources, and ideas that were unique to their homelands for objects, material resources, and ideas of other peoples. For example, Myaamia people grew a unique corn that other tribal communities desired and we often traded it with them for goods that were rare within Myaamionki. Following the end of the Beaver Wars, these trade networks resumed and valuable resources, objects, and ideas once again moved across the continent. But these old networks were infused with a new people and new objects, material resources, and ideas. The new “father” figure, the Meehtikoošia (French), brought massive change to these old networks. In return for the furs and hides of animals like amehkwa (Beaver), nalaaohki-alenaswa (Bison), moohswa (White Tailed Deer), and mihšiiwia (Eastern Elk), the French provided metal tools and weapons, firearms, and new types of cloth. Early on, the character of this trade was much the same as prior to the Beaver Wars. But by the 1720s, Myaamia people began to develop a dependence on French goods. Metal tools made it possible for more work to be completed in shorter periods. Metal kettles made it possible to cook at hotter temperatures and process more food, as with Maple sugar, for example. Firearms and metal tools increased the volume of animals that could be hunted and butchered, and these same tools soon became vital to the practice of warfare. As everyone acquired firearms and metal knives and hatchets, bows and wooden war clubs became less and less effective. Myaamia ways adapted to these new resources very rapidly in this period of stability, and within one generation people were hard pressed to maintain their standard of living without these trade goods. This šaaponaakani (mat needle) is a fine example of a smaller metal tool that made the production of traditional materials easier. This needle was used to weave together the leaves of the cattail plant in order to make the exterior mats that covered a Myaamia wiikiaami (home or wigwam). As the fur trade progressed, more and more Meehtikoošia (French) visited Myaamia villages and stayed for longer periods of time. The Meehtikoošia also began to build trading forts in and around Myaamionki (Place of the Myaamia). After the Beaver Wars the nearest trading post was at Detroit, but in the years that followed they built a fort near Saakiiweeyonki (Coming Out Place) and by 1722 they completed a fort at Kiihkayonki (Ft. Wayne, Indiana). The increased presence of the Meehtikoošia made it easier to acquire their trade goods and helped to strengthen the bonds established between the groups during the Beaver Wars. 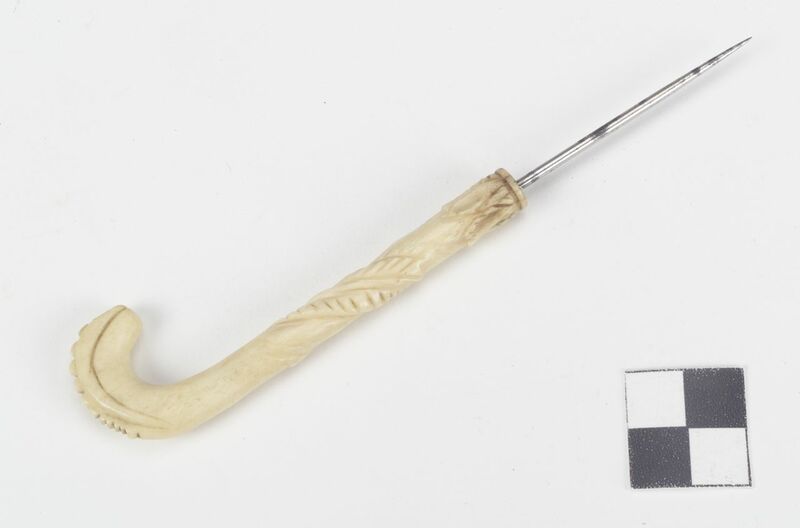 This šiipaakani (awl) is a great example of the hybrid use of European trade goods. The pointed tip came from European trade and greatly aided Myaamia women in the making of clothing, but the bone handle was likely carved by a Myaamia person according to their own preferences. It was in this period, that Myaamia people began to bring individual Meehtikoošia traders into their immediate families. At the Great Peace of Montreal, our ancestors recognized the Meehtikoošia as the “father” of a large family that included many different tribal groups. Within individual villages, many Myaamia families made this bond even more personal as they facilitated the marriage of Myaamia women with Meehtikoošia men. Intermarriage was a long established cultural norm often used to create alliances between families, different Myaamia villages, or between Myaamia people and other tribal groups. As Meehtikoošia men spent increasing amounts of time in our villages, this same cultural norm was applied to them. Some of these marriages produced children and lasted for the lifetimes of the married couple. Other marriages were much shorter and ended when the trader left the region. In either event, the marriages helped renew and reinforce the sense of alliance and relatedness that took root at the Great Peace. Through intermarriage Myaamia people became familiar with the language and culture of the Meehtikoošia and the traders became a part of a Myaamia family network, which they could turn to when challenges arose in their work. The children of these marriages became living symbols of the alliances between the groups, and as they matured they often served as interpreters at negotiations. Europeans were often puzzled and confused by these individuals, labeling them “mixed-bloods” in English or “métis” in French. However, their Myaamia relatives did not share this confusion. If these individuals lived in the community and dedicated their lives to the community, then they were usually viewed as full members of that Myaamia community. This was the only means of determining whether someone belonged or not. There were no “half-members” or “quarter-members,” one either was or was not Myaamia. Like all parental figures, the Meehtikoošia struggled to be good “fathers” according to the Myaamia understanding of the role. Our ancestors expected “koohsina” (our father) to provide for his children’s needs and to work to help mediate disputes as they arose within the family of tribes. Koohsina was not supposed to demand obedience; instead he was to offer advice. Koohsina was not supposed to punish his children; instead he was to offer forgiveness and the means to heal hurt feelings. At times the Meehtikoošia succeeded in living up to these expectations, and at other times they failed miserably. In 1747, these failures produced enough ill feelings that hundreds of Myaamia people left the Wabash River Valley to rebuild a village at Pinkwaawilenionki (Piqua, OH) and thereby distance themselves from what they perceived as a negligent and abusive “father.” The story of the village of Pinkwaawilenionki was the largest disruptive event during this period of stability. This story highlights the interesting ways that Myaamia people perceived their relationships within the family created during the Beaver Wars. In our next post we will pick up the story by looking at the village of Pinkwaawilenionki, the Place of the Ash People. If you would like to comment on this post, ask historical questions, or request a future post on a different topic, then please use the comments feature at the ending of this post or email me at ironstgm@miamioh.edu – This blog is a place for our community to gather together to read, learn, and discuss our history. Our history belongs to all of us and I hope we can use this blog as one place to further our knowledge and or strengthen connections to our shared past. Many historians and archaeologists believe it is impossible to determine specifically where Myaamia people lived prior to the Beaver Wars. 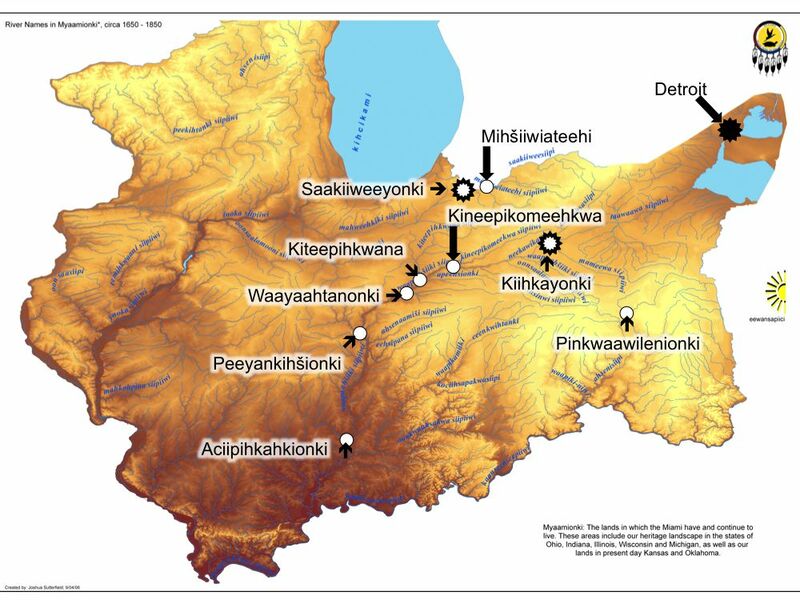 However, it is the perspective of many Myaamia researchers and educators that the layers of place names and stories connected to the upper Wabash River Valley are indicators of Myaamia habitation for an unknown period of time prior to the Beaver Wars. For more on the location of villages after 1701, see Helen Hornbeck Tanner and Miklos Pinther, Atlas of Great Lakes Indian History (Civilization of the American Indian series; v. 174. 1st ed. Norman: Published for the Newberry Library by the University of Oklahoma Press, 1987), 32-33, 40-41. For a full analysis of the issue of power as it relates to compromise among indigenous peoples and Europeans see Richard White, The Middle Ground: Indians, Empires, and Republics in the Great Lakes Region, 1650-1815, Cambridge Studies in North American Indian History. (Cambridge; New York: Cambridge University Press, 1991), 52. C. C. Trowbridge, W. Vernon Kinietz, and Burton Historical Collection. Meearmeear Traditions (Ann Arbor: University of Michigan Press, 1938), 66. Charles Poinsatte. Outpost in the Wilderness: Fort Wayne, 1706-1828 (Fort Wayne, Indiana: Allen County Historical Society, 1976), 4-6. One clear example of French failure were the “Fox Wars” in which the French attempted to convince their “family” to exterminate the Meskwaki (Fox). See White, Middle Ground, 149-75.